A Tamashii Nations in Lucca, Spain 2017 event exclusive, I was curious what was inside. 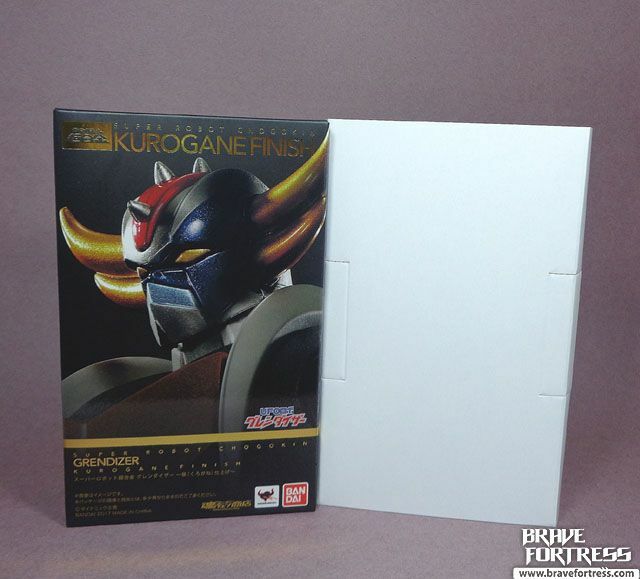 Turns out they just repacked the Tamashii Web Exclusive Kurogane Grendizer with a Spazer and made a new outer box for the set. 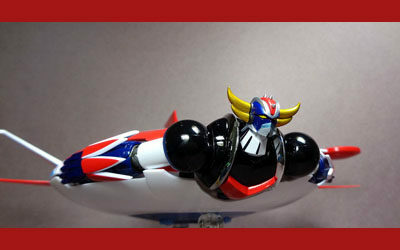 Grendizer is packed with a cardboard “filler” to increase the box’s thickness since his box is thinner than the Spazer’s. I didn’t open the Grendizer anymore since after opening the Spazer I think it’s safe to assume that it’s still the same Kurogane Grendizer that was previously released. Do note that this means it also still DOES NOT come with the Space Thunder effects parts that came with the mass retail version. Still, the Kurogane Finish version looks so darn pretty…. 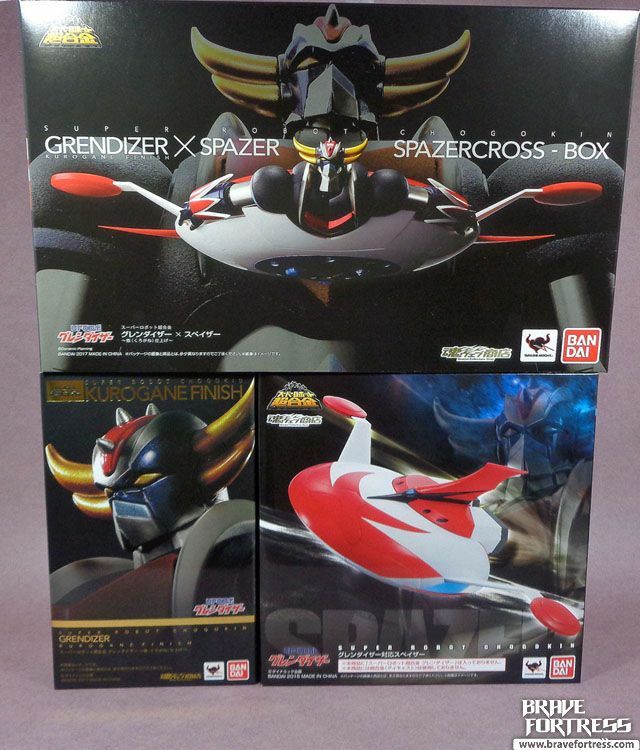 The real reason I went after this set was that I was hoping for an alternate matte finish on the Spazer (yet another Tamashii Website Exclusive item that was not released at mass retail) to properly match the Kurogane finish on Grendizer. Nope. 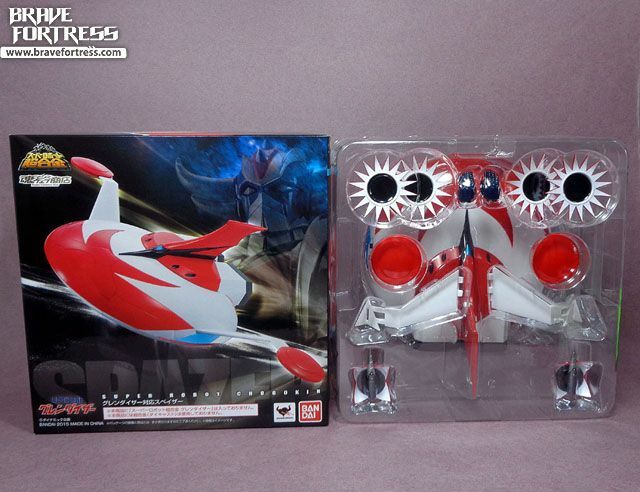 Turns out it’s a straight reissue/repack of the SRC Spazer in every way. I don’t know if these are limited to a certain number produced, as it isn’t really indicated anywhere, but I just did an Ebay check and one seller claims it is limited to 500 units produced. Bottom line, if you’re not a megacollector who has to have every version of SRC Grendizer out there, then this set is an easy pass. 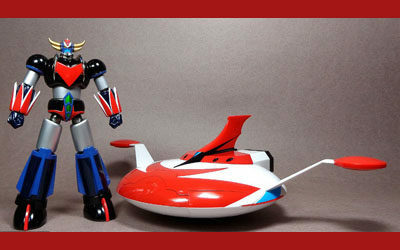 You can still get the Kurogane Grendizer and Spazer separately from Ebay and the like. The outer box here is the only reason to get this set. 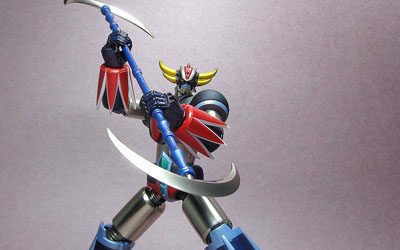 Here are the galleries to the Super Robot Chogokin Kurogane Finish Grendizer, the solo Spazer set and the Grendizer with Spazer set.